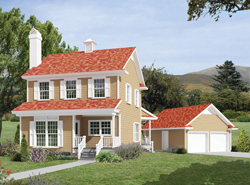 House plans with detached garages feature garages not attached to any portion of a house. They can be any size ranging from a one-car to three-car or more. Homes with detached garages may be the type you plan to build if the house plan you are building does not include an attached garage. Instead of altering the look of the house plan design, build a detached garage that matches the architectural style of your home design and that fits on your lot. 3540 Sq. Ft., Width 68'-0", Depth 97'-0"
The Grace Hill Craftsman Home has 3 bedrooms and 2 full baths. 1976 Sq. Ft., Width 57'-0", Depth 88'-6"
The Carsyn Traditional Ranch Home has 2 bedrooms and 2 full baths. 1742 Sq. Ft., Width 40'-0", Depth 62'-0"
The Kenley Luxury Ranch Home has 4 bedrooms, 3 full baths and 3 half baths. 4357 Sq. Ft., Width 124'-2", Depth 80'-10"
The Newstead Manor Luxury Home has 5 bedrooms, 5 full baths and 2 half baths. 7266 Sq. Ft., Width 123'-10", Depth 91'-10"
The Robyn Country Craftsman Home has 2 bedrooms and 3 full baths. 2196 Sq. Ft., Width 99'-0", Depth 89'-8"
The Harcourt Manor Luxury Home has 4 bedrooms, 5 full baths and 1 half bath. 5100 Sq. Ft., Width 121'-11", Depth 92'-8"
The Meadford Country Ranch Home has 4 bedrooms, 4 full baths and 1 half bath. 3579 Sq. Ft., Width 93'-6", Depth 70'-9"
The Lombardo Luxury European Home has 6 bedrooms and 5 full baths. 6363 Sq. Ft., Width 120'-6", Depth 107'-2"
The Prentiss European Luxury Home has 3 bedrooms, 4 full baths and 1 half bath. 4384 Sq. Ft., Width 140'-0", Depth 72'-10"
House Plans and More has a great collection of home designs with separate garages. We offer detailed floor plans including a wide variety of floor plans with detached garages, so we are sure that you will find the perfect house blueprint to fit your needs and style.